There are times, when no matter what you do and what you try, simply nothing goes your way. Your efforts seem to be in vain. However, this should not make you feel discouraged or desperate. In this dynamic and unpredictable world, things can always turn around, sometimes when you least expect it. This sounds very much true for the stock exchanges - hardly could you find anything more dynamic and unpredictable than these markets. Huge jumps are often followed by deep falls and vice versa. In many occasions, no reasonable explanation for such abrupt changes can be found. Now you probably understand why only a few people are surprised by the recent performance of Gold Bullion Development Corp. stock (CVE:GBB), (PINK:GBBFF). The shares continue their retreat on the TSC Venture Exchange (CVE). The stock has been regressing for the last two months. Since New Year, it has lost 43% of its value and since mid-February it has gone 35% down. Despite several company press releases and positive developments, the shares continue to sink. It looks, no matter what managers do and try, the stock cannot stop its downfall. Bullion tried to impress investors by disclosing encouraging news about its two projects. The company claimed to have discovered new mineralization zones there. Nevertheless, Gold Bullion probably has its reasons to anticipate a better future. The same financial statements indicate that the company had $7M in cash at its disposal in the end of 2010. Besides, in early January it issued incentive stock options to consultants. If the properties really prove to contain the mineral resources that Gold Bullion claims they have, then the company's efforts will eventually worth their while. You can learn about the future plans of the corporation from its February presentation found on Bullion's website. 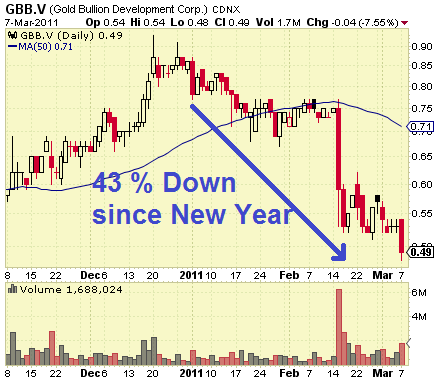 Are the Bad Days Over for Gold Bullion Development Corp. Stock (CVE:GBB), (PINK:GBBFF)?